We attend so many industry events these days—conferences, seminars, showcases and even summits—but I’ve never been invited to a ‘convergence’ before, so I wasn’t really sure what to expect from Dana Waranara. Now, weeks after the event, I can say that it has had a significant impact on me. It’s not yet totally clear to me how that impact will manifest itself in my work, but I’ll try and explain why I think this gathering will end up having a deep and lasting significance. For now, the best word I can come up with for the impact is to say that I have, in the best possible way, been disturbed by it. To quote the movie of the moment, “I feel a disturbance in the force”. More on that later. As the Dana Waranara program unfolded I started to feel quite privileged to have been invited into that space (as a presenter, non-artist and whitefella). This was driven home in a session honouring the pioneers of black dance in Australia. 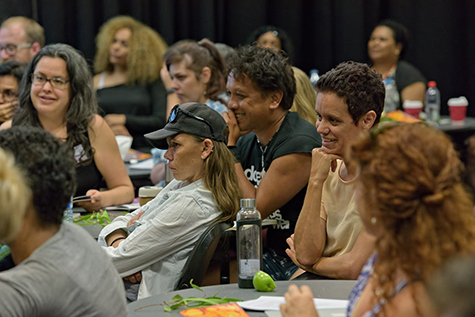 To hear from artists such as Carole Johnson, Roslyn Watson, Michael Leslie and Monica Stevens about the beginnings of this movement in the 1970s, was an historic and humbling highlight of day one. I had some knowledge of this history, but much of it was new to me. I don’t think the significant, ground-breaking contribution of these artists is understood as widely in our industry as it should be, so sitting there hearing their extraordinary stories felt a little like the sharing of a secret history, that one day will be recognised by more and more people. Although this gathering was not a showcase or performing arts market type event, for me as a presenter it was a great opportunity to gain an overview of the artists, choreographers and companies working in this field, giving me a greater context, and certainly inspiring me. To be surrounded by this extraordinary group of artists was quite humbling. Some are well known and recognised in our industry, others are early in their careers, filled with the infectious energy, enthusiasm and invincibility of youth. But I have to say that I was most inspired by some of the brilliant, more mature artists who’ve continued to nurture their practice over many years, creating beautiful, meaningful work away from the glare of larger festivals or venues (which in the industry we sometimes mistake for success). To hear from them about their work was quite special. That an artist such as Gary Lang is producing work of the calibre of Mokuy in the Northern Territory, that (to my knowledge) has not been seen elsewhere in the country, is exciting but highlights the need for us to find ways for such work to be seen more widely. In this mix of inspiring artists were also a few handpicked international voices, most significantly First Nations artists from the US, Canada and NZ. I was particularly struck by the wisdom and maturity of Maori choreographer Jack Gray. The gentleness and warmth with which he shared his significant experience as an artist highlighted for me how the Australian black dance movement, unique though it is, is strengthened by its international links. This is not only true of the important link with other First Nations artists and communities, but also of the very significant contribution evidently made to the movement by African American artists such as Carole Johnson who was in attendance, but also others who were mentioned, like Ronnie Arnold and Aku Kadogo. All of this sounds quite inspiring and energising, and it was (as well as being pretty intense, overwhelming and exhausting!). So, why do I say that I have been disturbed by it? Because my experience at Dana Waranara has further strengthened in me a belief that our current models of presenting are not serving us well. They do not easily allow for the type of truly impactful community and artist encounters that we need to be facilitating or inviting into our venues. Outmoded conventions, physical infrastructure and business models are barriers to venues being all that we could be for our communities. This of course, not only relates to the challenges of presenting contemporary Indigenous dance, but represents a wider challenge for presenters. What mechanisms might allow us to give up “expert curation” and allow our community greater power in programming our venues? Could we successfully hand over the programming reins to a wider, more diverse and representative group in our community? How? What different financial models would allow us to transcend the transactional nature of the relationship between artist and audience? Can we really expect to facilitate meaningful shared experiences between artists and audiences while we use a model that reduces the art to a product that presenters buy from producers and then re-sell to audiences? What might new financial models look like? Collective community fundraising/investing? Giving free access to events and asking the audience to contribute something afterwards? How could we remove or replace the conventions of theatregoing to allow a more inclusive experience? What could we do to break down the barriers between audience and artist, and between audience members, and create the conditions for more authentic, shared human experiences? There are lots more questions like these. Dana Waranara certainly didn’t provide any easy answers, but it did highlight the incredible work that Indigenous artists are doing around the country, and the need for us to find new ways to support, promote and connect that work with our audiences. It has inspired me to try and do this. BlakDance and Performing Lines should be thanked for initiating this important and historical convergence.